Little pieces of mee: "Mummy, can we do something crafty?" My eldest daughter loves doing crafty things, just like me. She loves doing Google Image searches with me to find new ideas of great kids craft things, so I thought I'd share some of our recent creations. Many of these are almost exact copies of the original work as my daughter also loves doing things exactly the same as the original, even though I try to encourage her to put her own touch on things. I've included links to the original works where ever I could still find them. The original bunny family was created by Crafts by Amanda. We used paper instead of paint as its much quicker for impatient kids to work with, and not so messy. We decorated them with felt for the bows, pompoms for the noses, a black marker for the eyes and whiskers and just cut the ears freehand. My daughter loves mermaids at the moment (hence the Ariel-themed birthday party a few weeks ago), so she wanted to make a mermaid of her own. These pretty mermaids are made using coloured paper (light pink for the face and blue or green for the tail) wrapped around a toilet roll and decorated with tissue paper and ribbon for the hair and Kindy Glitz to make the tail sparkle. The faces were drawn free hand with a black marker. To make the bottom of the tail, we cut the blue/green paper longer than the toilet roll and then just scrunched the loose section at the bottom in our hands after the paper was stuck onto the toilet roll. The inspiration was from Red Ted Art, but we used paper instead of paint. 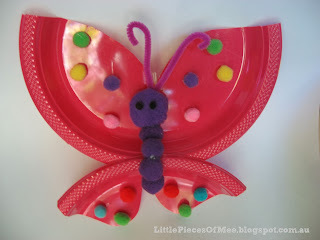 One of the things my older daughter found on a Google search was a pretty butterfly on the TLC website. As her favourite things include butterflies and anything pink, purple and silver, she loved it immediately and wanted to replicate it. We used a disposable plastic plate for the wings and pom poms in various sizes for the body and wing decorations. We also used a pipe cleaner for the antennae, and we stuck a piece of string on the back to hang it with. Everything was stuck together with hot melt glue as craft glue would have taken too long to dry (and probably wouldn't have held the plates together very well). After we finished the butterfly, my younger daughter wanted to make something of her own, so with some more pom poms from my stash we made this rainbow caterpillar. We used a large pom pom for the face and medium sized pom poms for the body, with two tiny black pom poms for the eyes and a small piece of black pipe cleaner for the antennae. The poms poms are all glued to a paper plate with hot melt glue. Another of our toilet roll crafts was this mega fairytale castle from Incy Wincy Art Club. Again I've used paper instead of paint for the colour. I actually couldn't find the right shade of pinky-purple in my paper stash so I printed some out using Word - I just made a rectangle on the screen in Word to fit a whole page and made it the colour I wanted and then printed it out - too easy! We used some kitchen paper rolls for the taller towers and topped them with some turrets cut out of purple cardstock (just a basic cone shape) and cut down some ordinary toilet rolls for the smaller ones. It was fairly easy to cut the tops of the walls using some scissors, and the my husband drew the brickwork, doors and windows on the towers. We stuck it all together with hot melt glue.